Every Sunday afternoon starting around 3 pm. Every Wednesday at about 4:30pm. Every Sunday afternoon starting about 2pm. Look for a group of us playing near the end of the parking lot South of the Manhattan Beach Pier. FREE!!! 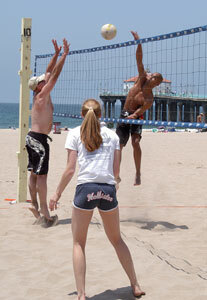 Are you interested in being on a coed 4-person volleyball team this year? Beach Cities Ski Club is running a summer long Tournament. There is one tournament per month and the finals are the fourth month. There are 3 divisions of play: Advanced, Intermediate and Recreational. We have several teams for each division, but are trying to put together more teams – especially for the intermediate level. If you want to play – email us asap – we’ll put you on a team. Please pass this info along to any friends you have who may be interested!